Commuters using Brixton station are facing months of delays and overcrowding as escalator work resumes today. One of Brixton station's three escalators is being refurbished, which takes it out of action until July. Twitter user @walkerij complained of huge crowds, while @mpezet branded TfL's planning 'a disgrace', saying a lack of crowd control meant people trying to get into the station were spilling into the road. 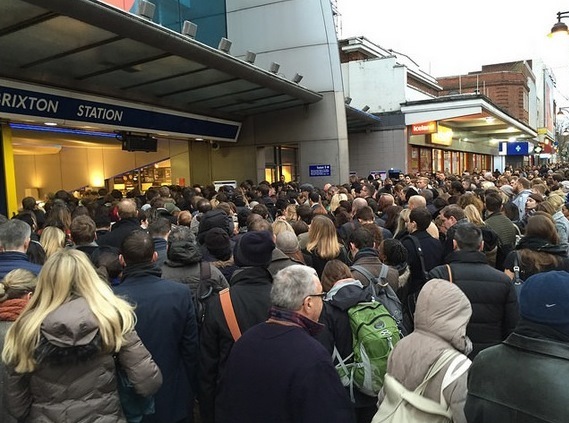 Victoria line commuters at Brixton faced similar crowds last November when another escalator was being refurbished. Brixtonblog has come up with a handy guide on alternative travel arrangements. Meanwhile, trains for Charing Cross will not stop at London Bridge until August 2016, while Southern have confirmed that their reduced service will continue until at least this Friday. Last week, passengers at London Bridge complained about severe overcrowding at the station and delays to train services. We wondered if TfL's advice about alternative travel may have sunk in as our trip in this morning was (relatively) problem-free. Not everyone was so lucky though — one Southern passenger complained of a whole train of people being dumped one station before London Bridge. Euston also appears to be suffering this morning, with cancellations and delays of around 30 minutes due to safety checks on the line between Watford and Milton Keynes. London's bus users also face delays on Tuesday, when a 24 hour strike by bus drivers will take place. Now would be a good time to work from home.